Getting news these days is more work than it used to be. In times of old, reading the local newspaper was probably enough: you could get local, national and international news in one place, and it was neatly categorized by its perceived importance. 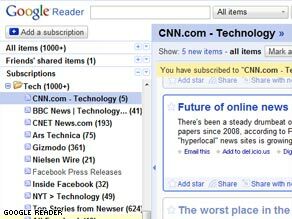 As yesterday's CNN.com story on "hyperlocal" news explains, that's changed. Now some publications focus exclusively on local happenings. Many news consumers turn to dozens of blogs, Twitter feeds, news stories and video links to get their daily fix. It's more work, but potentially there's more of a reward, too. For some, this is a sign the media is becoming more democratic: everyone gets a voice. But for the reader, sorting through all of this online information can be a maddening and infinite task. Enter the RSS reader, which brings headlines and scraps of information from your favorite sites to you in one place. But, as a recent Slate post suggests, there's a growing backlash against the RSS mindset partly because the interface is so artless. When you get all of your news through RSS, it all looks the same. There's no design flair, no prioritization of the content, no local flavor to the text-based feeds. It's like shoving the contents of all of your favorite boutique and thrift stores into a Wal-Mart-style warehouse. You know that sinking feeling you get when you open your e-mail and discover hundreds of messages you need to respond to—that realization that e-mail has become another merciless chore in your day? That's how I began to feel about my reader. Other news sites point to further reasons RSS may be falling out of favor: The Guardian, out of the UK, suggests RSS is being overtaken by Twitter. TechCrunch offers up an obit for the service. ... I bookmark blogs and place them in folders in Firefox that then become tabs that I can open. What that means is that within a couple minutes I can open between 35 – 60 blogs and sites ... My tab method is as follows. I’ve named them M1, M1B, M2 etc… the M1 is a bunch of blogs that I check out quite often during the day and as the folder numbers progress the less I check them out. The last folder (M5) is for new blogs and sites that I’m checking out. It’s a test phase to see whether after a couple weeks if they’ll make the cut to be placed in one of the other folders. Now, I know how to make bookmarks (I even share some on Delicious), and I have 15 tabs open on this browser window alone, but I wasn't sure how to make bookmark folders that I could open in bulk. For those of you who are similarly clumsy with browsers, here's what you do in Firefox: open up a bunch of sites you want to put in a folder; from the Bookmarks tab, select "Bookmark All Tabs"; give the folder a name ("tech blogs" for example); then, when you want to see all of your favorite tech blogs, just pull up the folder, again from the Bookmarks menu, and select "Open All Tabs" from the bottom of the list. And Shazam! All of your favorite sites in tabs. The major problem seems to be that this method can clutter your desktop. It's also a bit more difficult to constantly check to see when your favorite blogs have updated. What do you think? Have RSS feeds, as DesignPosts says, become a "never ending chore?" There are plenty of RSS evangelists out there: what do you have to say? Any other methods for making online news faster and more fun? I'm going to try out the tabs method this week and will report back on how it goes. Until then, jump into the discussion in the comments. Must be a slow news day. Your article seems based upon the "recent Slate post [that] suggests, there’s a growing backlash against the RSS mindset partly because the interface is so artless. This is nonsense. What "backlash?" For that matter, what "mindset"? I you use RSS fees for "art" or enterntainment you need help. You use RSS for quick updates to information that has a likelihood of holding interest for you. Plain old iGoogle is just fine as an organizational tool to get a reasonable number of RSS feeds. You can scan the headlines quickly and decide whether to click through to the orgininating site to see more detail and "art" if you need it. No one outside the media who has a full time job has the time to check constantly for tweets, whose reliaiblity as a news source is at best questionable. We need news gathering services with knowledgeable reporters and seasoned editors to get reliable, in depth, information. If you don't like looking at RSS, then don't look at RSS. Gee, that's hard. What a tribulation. I'm sorry, but Twitter is NOT a replacement for engaging well-written articles. Most of the time Tweets just make me wish everyone would just shut the h. up for awhile. I only check my Twitter and Facebook feeds a few times a week. Every morning I check my RSS feeds and read a few articles. Yes, RSS needs a bit of a makeover. Some Newsreaders try. Google Reader works very well. I use Newsstand on my iPhone, which has some options you can enable to change the look of the page (even allowing you to browse your feeds as if they were magazines on a rack... how quaint). Personally I just pick the theme that is easiest on the eyes and turn off the fancy graphics. I just want to find quality articles quickly. Sometimes Tweets that link to articles help with this, but most of the time that requires wading through tons of mindless tweets telling you more information that you want or need about so and so's day. Personally I believe the Twitter backlash started the moment they started talking about it on the Today show. Soon a clever developer will come up with a new spin on the RSS feed. Maybe it will be something that collects your RSS, Tweets, Facebook updates, calendar, e-mail, online bookmarks, diggs, etc. and puts them into an interface that doesn't drive you nuts because of all the junk flooding in all the time. I know some developers have already tried, but I'm still waiting for the killer app that will make filtering all of this noise much easier. I don't see twitter replacing RSS feeds anytime soon. The major failing with that solution with twitter is that it doesn't actually solve the problem of being inundated with lists of brief 'artless' updates. The end result is essentially indistinguishable from the other. Personally, I feel that if people are being overwhelmed by their RSS feeds they simply need to prune their feeds down. i couldn't disagree more. RSS feeds are the present and future, not slowly becoming something of the past. if you want the "design," then go open up as many tabs as you desire. more and more websites are padded with irritating design elements that disguise their lack off intelligible content. i don't need that. i prefer content above all, and i don't care if it's all written out in plain text. it's not a chore to use Google Reader because i work hard to optimize my experience and weed out the feeds that don't deliver over time. saying that RSS feeds are dying is like saying that email's dying. yeah, there's an unglamorous side to reading everything as minimal text, but the content takes precedence in that format, and i get access to greater amounts of information and knowledge at a greater speed. if someone is having gripes about their RSS reader, then they just need to delete the bad feeds and get some new ones. RSS is just the underlying technology, like HTML or CSS, and isn't the problem. The problem is that RSS readers don't add much value beyond letting you read more of the same a bit faster. We need products that add real value for readers, beyond aggregation. We don't talk about HTML Browsers; let's stop talking about RSS Readers, and just create "Readers" that really help us sort the signal from the noise. They haven't become a chore at all. I have the few that I really want to follow, and that's it. Sounds like the problem isn't that RSS is 'artless', more that people drown themselves in it and don't know how to delete the ones they don't really want or need. I don't find rss feeds outmoded at all. I use them for news, and when it comes to news I could care less about the web design, as long as it doesn't get in the way. With my feed reader I can chose which news source interests me, follow up on any story whose introductory paragraph intrigues me, and trash the rest. As far as news going local is concerned, my local news sources have feeds, too. I can compare their coverage of interesting issues to national coverage (when applicable), and follow local interest stories with ease. There is no problem with RSS. It is a different medium. I use FeedDemon to stash hundreds of RSS feeds separated into several folders. I have certain feeds I visit regularly and others I look at less often. I don't feel the need to hit every RSS feed I have on a regular basis and have no problem skipping them for months. I know I can go back and look at the archive. In addition I have several searches that look for certain keywords and pulls those into a file I look at regularly. I could never do this with twitter or with my browser. RSS is a different medium. RSS is a tool. I have never used RSS as a consumer of info streams, but I find it to be an invaluable tool for social networking development. My Google Calendar, facebook status, twitter updates, blog posts, craigslist ads and chat availability are all feed to a variety of sites through RSS streams. Updating this data separately would be unmanageable, but automating the process with RSS makes social networking less work and more fun. RSS is superior to these 'hip' new things. The drab, monotonous appearance of RSS feeds is the problem. It would be great if there were an RSS aggregator that could arrange your RSS feeds to look like a magazine or newsletter table of contents page, with some feeds having bigger headlines, different colors, scrolling, or show snippets of the first paragraph of the news source that's being fed. Surely there must be a way to program this. With the plethora of news sources out there and wide adoption of RSS, this should be welcomed by information providers even if it means specially formatting their RSS content a bit more. Safari 4 has the ability to pin your favorite sites to an "expose" type screen. When a site has been updated since the last time you viewed it, it shows a little star in the top right corner. I find this incredibly useful for checking my blogs for updates without having to sort through all of them OR use an RSS reader. For those of you who use RSS readers: Do you think Web design will become a thing of the past? What's the point of a site having it's own look or feel if people get all of their information from a hub that looks completely different? If you feel overwhelmed by your RSS feeds, it's probably just time for some RSS house cleaning. If your article read 'are RSS readers dead?' I may have been more agreeable. RSS Readers is very different from RSS. The "RSS Reader" is the rendering engine. RSS is the data format used for exchanging information between internet entities. Think of RSS as a 'universally understood data exchange format' in the internet world. Now look at Mashups. Every mashup editor understands how to work with RSS. To them 'RSS' is *input* to do something fancy on top. So if data gets exported as RSS, there are infinite applications that can use them right away to do innovative things on top without new APIs, etc. That's what RSS brings to the table. To John of CNN, unique websites will not die because RSS feeds simply link back to the websites being fed. As city newspapers thankfully die out, the need for newspapers remains. And what were newspapers? They were syndicated, independent columns, comics, stories from news organizations, input from their own reporters, legal notices, and ads. What would an ideal RSS aggregator be? independent blogs, comics, stories from news organizations or anyone who could file an iReport; notices, schedules, and ads. All fed to, and customized by the individual to look they way they want it. In short, an electronic newspaper, with sources gathered from everywhere onto one portal, which is what newspapers did. Only this time users could have updates more often and change and rearrange the content to suit their own interests. Not to mention being interactive. Content could either link back to the originating website or appear in a popup window in the aggregator. That's more-or-less what you can do with your 'favorites' menu now, but you can't see headlines from all your favorite news/info sources on one page. For those of you who use RSS readers: Do you think Web design will become a thing of the past? What’s the point of a site having it’s own look or feel if people get all of their information from a hub that looks completely different? News articles and blogs do not represent all content on the Internet. The great thing about RSS is that it is XML based, which means that the same information can be displayed in many different ways: In a Web browser, on your cell phone, on your iPhone app... It's more about making the content accessible anywhere at any time. There are pros and cons to this, and quite often I will visit the websites I subscribe to rather than read the RSS feeds. Other times I will start with the RSS feeds (especially when I'm not sure what I'm in the mood to read). Most iPhone and browser based news readers allow you to view the article on the host site anyway. The newsreader app is just a jumping off point. Good Web design is perhaps more important because of RSS. Now you have the challenge of attracting people to your site even though they can just get your content through a newsreader. When a website is well designed, easy to navigate, and offers a clean interface without a lot of distracting stuff everywhere I prefer it over my newsreader. If the site is difficult to read and navigate, or just plain ugly and obnoxious, I will usually read the content in my newsreader. RSS is great when you want to browse headlines and read a few articles. Twitter is great when you want to read the minutiae of the people you follow. Search engines are great for finding specific information, and websites are great when you want a more in-depth experience. Good websites are dynamic and will help you find the content you want but didn't know how to search for. I'm going to clean out my RSS reader a bit (it's definitely cluttered) and will try this tabs business, too. Will report back on what seems easier. Of course, you can always use a combo of methods - RSS reader, Twitter, grouped tabs, Facebook, Delicious, Digg, the list goes on forever - to get your news. Thanks for the interesting discussion. What I find most interesting is not necessarily the technology - RSS reader vs. tabs - but how these technologies change the way we get news, how much we enjoy that experience, and how it changes what news we're getting to. Wait ... so the complaint about RSS is that it's not pretty? Wow that's shallow. Why not pose an RFC to create RSS 3.0 that supports CSS? Then you could make your RSS feed "pretty". If you feel that you don't have time to read all the new articles generated by your feeds, you should try using http://www.newsgator.com/individuals/feeddemon/default.aspx which has a feature called "Panic." This aggregator is one of the few products provided for FREE by NewsGator Technologies (http://www.newsgator.com/companyinfo/default.aspx) and the great thing about the "panic" feature is you can have a lot of untouched or old posts deleted from your feeds based on a few parameters. This basically removes you from the process of having to mark items read or having to go through old articles that may be outdated. RSS is an excellent tool that brings value in this day and age of technology. I find it a lot easier to go to one website and read a ton of articles from a ton of websites. And the best thing is, about anything can be subscribed to as a feed. And if the article does grab my interest I will follow the link to the publisher's website to read the full article and I might find other articles of interests while I'm at that site. Also I can share my feeds with friends or family and vice versa. You can even have your email set as a feed. All this talk and no mention of mobility. RSS via Google Reader is a thing of beauty on the iPhone. 75% of my surfing is done on the iPhone – why on earth would I bother with that messy Firefox tabs thing? Now that sounds clunky! Reading RSS feeds is a chore only if you make it a chore. It becomes a chore when you pressure yourself to read through every single one of them, which is impossible when you have well over 100 like me. I just quickly scan through them, and if I see one I want to read, I click on it. Using RSS feeds is a lot easier than the bookmark tab suggestion. If anything, RSS feeds will let you know when your favorite blogs have posted something new. Then, you have the option as to whether to read it in the plain, boring reader or to go to the web site and see it in its full glory. Reading RSS feeds doesn't have to be complicated. @Kevin: The complaints seem to be that RSS readers are not interesting to look at and are potentially too stressful. There's also the idea that readers are becoming dated, and aren't keeping up with more innovative platforms like Twitter. Not saying I buy all of the ideas, just saying they're out there. I'm looking for the best user experience, which is different for everyone I suppose. I'm trying the tabs idea this morning, and when I opened 22 of them at once my browser (Firefox) gave me a message that said, This may slow down your browser. So that's a minus on the tab side. But I did enjoy seeing some Web pages that I haven't actually looked at in a long time because I just get everything through an RSS reader. The solution to this "artless" problem is simple: feedly http://www.feedly.com It is a full featured RSS reader but designed as a magazine. I also make sharing through twitter dead simple. Media 2.0 at its best. I use my Bookmarks Menu. A click on Bookmarks on the menubar reveals the whole menu, number of updates, couldn't be simpler and Safari's RSS interface isn't ugly! How amazing is that! RSS is not likely to go anywhere. I prefer it for the exact reason that some complain about it – it is "artless." I don't want to have to dea with the clutter of bad design that some news sites or blogs use. Using my feed reader simplifies my news/blog reading. If I want to see someone's sidebar, TwitterFeed, or pretty picture layout, I'll click over to their blog, in a new tab. I use netvibes.com for my feeds. It's better than google. Best 1080p movies and hd video. 1080p movies and hd video. Full HD 1080p Movies. Blu ray movies 1080p. 1080p bluray movies. Best 1080p movies, download full hd, 1080p download, download hd movies, movies in hd, 1080p movie, 1080p movies, movies on hd, 1080i download, 1080p movie download. Blu Ray Movies and DVDs. Blu-Ray DVD movie, hd movies, hd dvd movies, hd download, hd movie, blue ray movies, hd cinema, high quality movies. Thanks for the auspicious writeup. It in reality used to be a entertainment account it. Glance advanced to more introduced agreeable from you! However, how could we keep up a correspondence?